I appreciate your post, Dorothy. That said, I’d suggest you read some of Maureen Dowd’s comments about Catholic nuns in the U.S. As for the nuns’ conduct in the 1960s, I don’t think it reflected ‘child-rearing’ practices of the times. The Sisters of Charity at St. Francis Grammar School were the least charitable group of women I’ve ever encountered. They routinely beat, bashed and belittled us as we struggled to survive the physical, mental and emotional havoc they wreaked. There’s no way their conduct was a product of the times. That’s a cop out. My peers from those days would agree. Many still carry deep psychological scars courtesy of the good sisters. As someone who WAS a nun for 18 years I deeply resent the characterization of these women as outlined by this article. The reasons why communities of sisters are dying are many and varied but they have very little to do with the womens movement or the role of women in the church. One BIG issue contributing to their demise is the fact that they do NOT have the funds to support the elderly sisters as they age and need medical care etc and any young woman today would be very short sighted to join these communities and end up as an elderly old woman with no support system. As far as the comments suggesting that nuns overdisciplined their students up until the mid sixties – it is probably a fair comment but child rearing practices were quite different then as opposed to now. I am a product of the catholic school system of the fifties and I owe them much . I got a good education and learned self discipline and organization. It has contributed to my professional success throughout my life and given me a lifelong love of learning and a strong faith. SO before you project to know EVERYTHING about this issue- take it from one who walked in their shoes- this article is FULL of hot air. Our sisters of charity used a wide array of disciplinary techniques ranging from ear and hair pulling to rapping of knuckles with rulers and, my favorite, not allowing the boys to use the rest room when in need. The latter were then made to stand in front of the classroom and endure public humiliation. Nothing charitable about the nuns. Paddles were used in pretty much every public school I ever heard of growing up (this was in the 70’s) but never saw them at all in a Catholic school, and I went to both. My parents told the public school administration that if they EVER laid a hand on me with a paddle or anything else, they wouldn’t want to know what would happen next! I am appalled by the Magdalenes story, but there are many Catholic churches and orders today who are NOT like this, so do not condemn all for the sins of some. Monika: I’m glad to hear you had outstanding interactions with nuns. Sadly, a good number of people with whom I went to Catholic grammar school suffered some truly heinous physical and emotional harm at their hands (and fists). Hopefully, whatever nuns are still called to the habit are better adjusted and more compassionate human beings. i feel you are doing what alot of peple do -stereotyping nuns. i am a nurse, and i would be horrified if you condemned all nurses because of the actions of some nurses who comitt crimes or abuse towards their patients. in former years there were alot of peole who became nuns who did not have a true vocation, but became nuns due to family or otherwise pressures. -these people saw leaving as a failure, so stayed and the life damaged them because simply they never had a vocation in the first place – they somehow slipped throught the system. i feel these have tarnished the reputation of many good nuns, but i think nowadays, the vocations tend to be more genuine, and this can only be a good thing. i was a novice nun for 2 years with the carmelite order, and although i decided the life was not for me, i was met with true kindness- more than i have ever known. I DISAGREE WITH ALL OF YOU YOU KNOW WHAT, THERE ARE MANY NEW CONGREGATIONS OF CATHOLIC NUNS WHO ARE ATTRACTING NEW MEMBERS. THE DOMINCANS OF ST. CECILIA CAN’T HAVE ENOUGH ROOM BECAUSE TOO MANY YOUNG WOMEN ARE ENTERING THEIR ORDER. THE SAME IS TRUE FOR THE FRANCISCANS OF THE RENEWAL. THERE IS A MARVELOUS SPRINGTIME IN THE CATHOLIC CHURCH AND THE HOLY SPIRIT IS LEADING THE WAY! NOT THE DYING EPISCOPAL CHURCH!!! I see many comments here from ex-Catholics and anti-Catholics, but none who can represent what the referenced article was actually about. I am a 22 year old woman planning on joining the Carmelite order of nuns. I am quite happy to think of becoming the Bride of Christ and giving my life solely to Him. During my process of exploring my vocation, I researched and visited many orders. The fact is that orders that chose to liberalize in the 60s and 70s are dying out. One liberal order I visited had one postulant for the entire diocese. Other more traditional orders,such as the Carmelites, average between 10-15 postulants at any one time. It sounds like you had a tough time with the nuns at your old school. I’m not a fan of corporal punishment, but I have to say it works some of the time if not done in anger. The Church certainly does not condone abuse of any sort, and those who harm children will seriously have to answer to God. I think you should know that most nuns I have met are very gentle and peaceful people, not at all like those you describe. This discussion brings back memories. I was raised Catholic but my upbringing, I hope, was more the norm. Sounds as if some of you have had some unforgivably horrific experiences. There was a good bit of knuckle rapping for slouching or talking. For the more recalcitrant kids, paddles were used. I don’t remember feeling fearful; it was just pretty typical Catholic discipline and not a whole lot different from what most of us experienced at home. Parents knew what was going on and they expected it. Attitudes about corporeal punishment were very different then, weren’t they? ‘Discipline’ was one of the advantages of a Catholic education! Today, teachers and principals would get sued/thrown in jail for the punishments they meted out then. The problems with the Catholic brand begin with the Church’s attitude toward women, and includes the requirement of celibacy. The priest scandal and how it was handled has really damaged the brand and made it an object of derision. I have come across evil nuns and priests in my day, actually. I try to seperate my faith in scripture (which is strong) from my bad expierences with people who may have used that scripture as a weapon, however. In short, most priests and nuns scare me. Andrew: Damn right I’m defensive. Defensive of those who, for centures, have suffered under the Catholic Church. See my first post. It is religious terrorism. Ed B…you were lucky…besides the beatings and attempts to destory all self esteem…I still have nightmares of the times that I was punished by being locked in a dark room in the convent that had a temperature of 100+ degrees …most of the nuns that I came in contact with were sick people. Glad to hear you had a positive experience, Ed B. But, I can assure you the Sisters of Charity stories are not overdone. Many of my best friends carry psychic scars to this day from the mistreatment. And, I knew of at least one nervous breakdown suffered by a poor, little pre-teen by the name of Freddy, courtesy of those anything-but-charitable nuns. A little defensive are we Dandy? I think Ed B raises a valid point. Just because others have had run-ins with “evil” nuns, doesn’t mean that you should label the entire institution. Talking about “evil” examples is always more fun = bad customer service experiences, poor manners, awful new biz pitches, scams, nightmarish work commutes, etc. It’s unfortunate, but in our society people (and the media) aren’t as quick to highlight the “good” experiences. I think you should be careful stating that the “evil nun thing is way overdone.” That’s the attitude that allowed so many priests to get away with abusing your boys for so long. Open your eyes and help those who cannot help themselves. Wow. This sounds like stuff out of the lurid female prison guard movies and pulp fiction of the 1950’s. Got to tell you I have a different take on my nuns in grades 1-7. 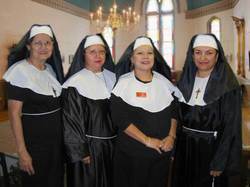 I had the Sisters of Divine Providence (of San Antonio)and I owe them a debt that can never be repaid. As teachers they were very professional and dedicated to their students. Of course they were strict, but they taught us civility and good behavior and expected us to live those lessons at school and at home. Sorry to be contrarian, but I think the whole “evil nun” thing is way overdone. I think 90% were devoted, competent, and a good influence. Leo, I think anyone who was “taught” by nuns has a story or two. My grammar school buddies and I love to replay the various horror stories from good old St. Francis whenever we get together. There was Sr. Julia Michaels and the gold ruler she’d use to rap knuckles the knuckles of any one who misbehaved. Then, there was Sr. Catherine Imelda, who just beat the living hell out of the male students (and only the male students). And, last but not least, we had Sr. Catherine Winifred, the school principal, who could literally stop a clock with one of her evil looks. Man, those were scary days. I find this topic wierdly fascinating, as I too fall into the ranks of those who when asked my religious affiliation, reply “I was brought up Catholic.” I attended public school, but was taught by nuns in CCD class who apparently enjoyed terrorizing kids on the weekends. I guess it was their version of playing 18 holes of golf. I’ll see all of you in hell! Our new church in California (where I show up much less than my Catholic upbringing would dictate) actually tries to avoid using statements that include men, e.g., instead of “for us men and for our salvation,” it’s for us and for our salvation.” Very California, but very enlightened too. There are plenty of non-Catholics who attend and gay couples who hold hands without anyone rearing back in shock. There are plenty of traditionalists too (I think the Knights of Columbus are pretty active) but it seems like most are able to accept people for what they are and what they believe. Too bad most religions, including this one, don’t make that the bottom line. God, in his (or her) infinite wisdom, has to realize that the Church has made some serious mistakes in terms of attracting and retaining talented men and women to its ranks. The Vatican’s old boys’ thinking will eventually force a break and, like many others who have said so in the past, I believe we’ll one day see a separate Church in the U.S. that ordains women as well as men and allows marriage. In my mind, it’s not a matter of “if” a break will come, but when. David: God’s going to get Rep for what, exactly? Would have thought “March of the Penguins” helped with recruiting !!! Rep, I would argue that while the Sisters of Charity types you were subjected to in grade school are a part of the image problem in attracting young women, the real issue is what you describe later in the blog, namely the Church’s refusal to give women an equal footing in serving it and its members. My own aunt — a Dominican nun, has been a teacher in the Bronx, Chicago’s South Side and other tough neighborhoods for decades, and she’s amazing. But even she and her friends don’t see much hope for the sisterhood in the future unless the Church hierarchy gets its head out of the sand. I remember the days when I was an altar girl in the Catholic Church – I loved to serve weddings b/c I would make a couple bucks or even some funerals – but then 8th grade year, the new bishop was having none of this altar girl thing. After I (sacrificed) getting up early on Sundays, carrying that heavy brass cross and had to wait on priests wearing a heavy robe with no air conditioning and passing out twice during mass – my father’s none faith views became a little more attractive. Yea, good luck to them on obtaining more nuns – but I would have to say that whole celibacy thing kills that calling. Episcopalians have a much better shot and obtaining converts. send me the info on that property- i might be interested in a barter deal for some great land i just bought on the alabama coastline..
What a memory you have, med supply exec! Ed and I did indeed meet in a St. Francis “after school” detention one rainy October afternoon in the late 1960s. As I recall, Ed had made inappropriate advances to one of the nuns and I had been caught lifting wine from the Sacristy. And, if you believe that, I have some riverfront property in New Orleans you might be interested in. repman- didn’t you and ed first meet up at st. francis grammar school? I for one hope their ranks continue to shrink. The award-winning film “The Magdalene Sisters” is the true story about a brutal and sadistic order of Catholic nuns, who, for 150 years operated homes in Ireland for some 30,000 “unpure” or potentially wayward girls. (Some were there because they just looked at boys thru the bars of their school yard. One girl was there because she had been raped.) They were literal slaves- worked sunrise to sundown in a laundry- scrubbed their hands raw and were fed basically leftovers. They were forbidden to speak and were brutally and sadistically punished both mentally and physically. Many of these girls eventually descended into madness and some committee suicide. When did these asylums close? The late 90’s. 1990’s that is, not 1790’s. I say this was religious terrorism, akin to Osama; it certainly was my final straw with the Catholic Church.